September 15 is a holiday for those who like mint-flavored liqueurs as the National Crème de Menthe Day is celebrated on this day. Crème de menthe is translated from French as “mint cream”. It is a sweetened alcoholic beverage (liqueur) flavored with Corsican mint. It is available in two variations: green and colorless (referred to as “white”). Crème de menthe is traditionally made by steeping dried mint leaves in grain alcohol for several weeks, filtering, and adding sugar. It can be served by itself as an after-dinner drink, poured over ice or used as an ingredient in cocktails. It can also be used in food recipes as a flavoring or topping. 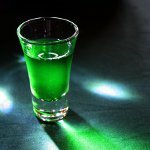 To celebrate the National Crème de Menthe Day, throw a cocktail party and serve cocktails which contain this liqueur, such as grasshopper or stinger. To make a grasshopper cocktail, pour 1 part Crème de menthe, 1 part Crème de cacao, and 1 part fresh cream into a shaker with ice. Shake briskly and strain into a chilled cocktail glass. Stinger is another popular cocktail with Crème de menthe. To make it, pour 5 parts cognac and 2 parts Crème de menthe into a mixing glass with ice, stir and strain into a rocks glass with ice or cocktail glass. Stinger is typically made with white Crème de menthe.